Robert Liebowitz has suffered from kidney disease since he was 12. By 60, the New Jersey father of five knew he was dying so he took one last trip to Walt Disney World in Orlando in August with his children. He was on a kidney transplant list but time was running out. 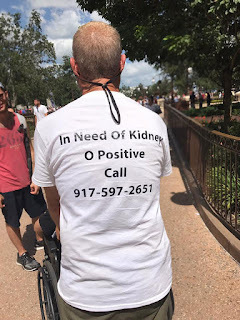 So, with the help of his daughter, Liebowitz designed a simple, white T-shirt with black lettering that read: “In Need of Kidney. 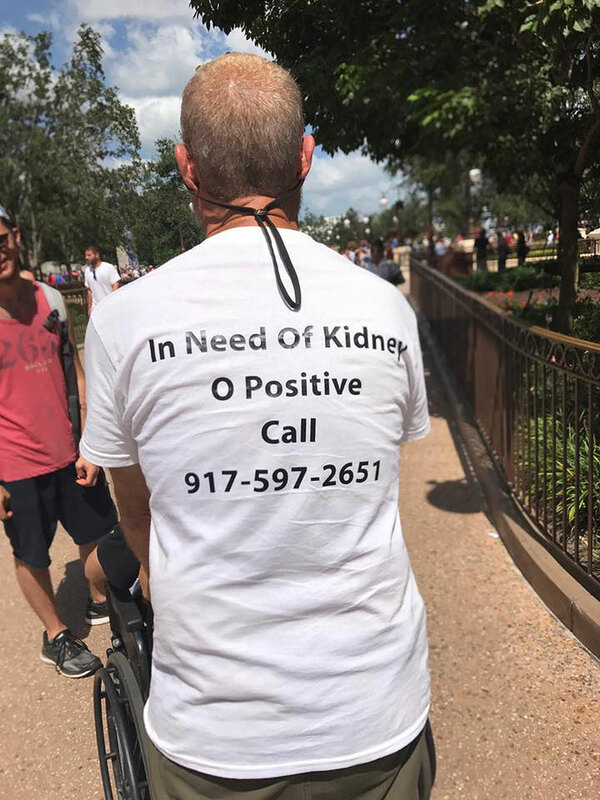 O positive.” He added his phone number and turned himself into a walking billboard at the theme park, the Orlando Sentinel reported. Liebowitz wore his T-shirt for nine days at Disney. People snapped photos and took videos of the message and shared it on social media. Richie Sully, a single dad of two girls, ages 11 and 5, from Indiana, saw Sandoval’s post. He got himself tested, and found he could be a suitable donor. He flew to New York City, at his own expense, and donated his kidney to Liebowitz. The surgery was performed Jan. 18 at New York Presbyterian Hospital. But Liebowitz says it is a big deal. “You can’t put into words what he did for me, so I’ll have to figure out how to do the best I can for the rest of my life,” Liebowitz told WPIX. The Liebowitz and Sully families plan to go back to Disney World and hope the Sandovals, who snapped and posted the photo, will join them.